The BLOOME is awarded to Society members with education and outreach projects that advance youth, student, or general public knowledge and appreciation of plant biology. On behalf of ASPB, the Education Committee is pleased to announce these four projects selected for the 2016 Plant BLOOME Grant. University of East Anglia, Norwich, U.K. The goal of this project is the creation of a comic book series that communicates plant biology research to children ages 9 to 12. The fundamental idea is very simple: to find cutting-edge plant biology research projects, and transform the process, concepts or outcomes shared in these papers into a visually and mentally stimulating format that engages young readers. The fascinating content, beautiful illustrations and adequate level of complexity of the comics will stimulate children’s interest in plants at a very young age. The co-PIs want to explain plant research projects to children because they believe young minds are capable of and will be inspired by learning about the intricacies of what plants can do. Anna and Isotta also want children exposed to the concept of using primary research to become informed citizens. More specifically, the comics will explain topics that would never be part of a standard school curriculum. They will provide a glimpse into real biology so children (and adults) can see that while photosynthesis may be a familiar beginning, plant biology research certainly goes much further than that. The comics should make children aware of the overwhelming importance of plants for nearly every aspect of human life and increase the plant biology literacy of young school children. Children reading the comics should feel encouraged to use their natural inquisitiveness in biology and discover that a further study of plant biology could be very desirable and fun as well as lead to a future career. To ensure that the comics are suitable for specific learning levels and interesting for the targeted audience we will develop an evaluation plan with classroom teachers. To enhance the comic book series’ successful dissemination, each book will be translated into multiple languages and distributed online via ASPB’s and other channels. Anna and Isotta also will present them at the upcoming Frankfurt Book Fair (one of the World’s largest) and at Plant Biology 2017 as well as other ASPB outreach venues. The comics could become a viable part of biology school lessons anywhere in the world but also be found as the favorite title on a bookshelf in a children’s room. Its unique cross-curricular integration of knowledge. 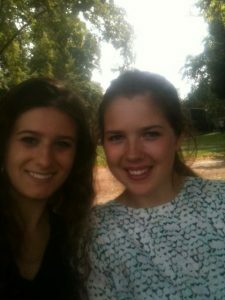 Anna is a student in the School of Biological Sciences and Isotta studies in the School of Literature, Drama and Creative Writing. The PIs are undergraduates clearly establishing a creative and thoughtful career path that includes clever outreach. Plants play a critical role in our daily lives. From serving as the foundation of our food system, to contributing to biotechnology solutions for global challenges, the importance of plants is undeniable. Yet, plants are often taken for granted by the general public and often made to take a back seat to the allure of studying animals in K-12 education. In order to raise awareness about the importance of plants and bring them into the limelight in science education, it is important that teachers are provided with high quality, engaging activities that complement their curriculum and align with state and national standards. This project will bring together plant researchers with education experts in the development of resources designed to engage students and the public in learning about how plant research impacts our lives. This will be accomplished through a partnership between PhD Fellows, faculty and staff at the Center for Applied Plant Sciences (CAPS) – at The Ohio State University and educators from the Center of Science and Industry (COSI) – in Columbus, Ohio. The resources developed through this proposal will reinforce plant science concepts in both the general public and students in grades 6-12. Concepts such as plant- based biotechnology, food systems, agriculture and climate change will be highlighted. These resources will reinforce important science concepts while exploring global challenges and current research related to plant science. The IVC program and extension activities will engage students in hands-on investigations, discussions and demonstrations that promote critical thinking. The educational videos will condense the core messages presented in the IVC program into fun, fast-paced mini-lessons that will be made available as a free online resource for students, teachers and the general public via the CAPS webpage. These new resources will complement, expand upon and provide an opportunity to promote existing education materials current offered by other plant science organizations such as the ASPB, Wisconsin Fast Plants Program, Indiana University and Science Forward. Evaluation results from the pilot phase will be used to refine program materials prior to making them available to schools throughout the United States, Mexico and Canada. Utilization of the resources developed through this proposal will lead to an increase in plant science knowledge, positive attitudes towards learning science, and awareness of plant science career options. Mark first developed a passion for plant science while serving as an agroforestry volunteer in the U.S. Peace Corps, where he started a reforestation program that brought iguana ranching and sustainable land management practices to his site in rural Panama. 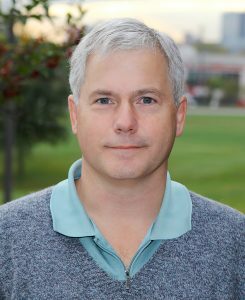 In more recent years, Mark has been involved in an ongoing study of population genetics with box turtles, in collaboration with scientists at Princeton University, and has worked with the Princeton Neuroscience Institute to guide his students through the process of peer review for the online neuroscience journal Frontiers for Young Minds. 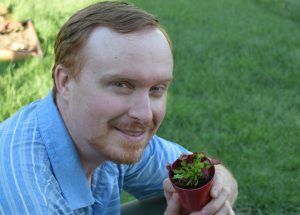 Mark looks forward to sharing his experiences with the BLOOME grant through the website he’s developing at http://www.plantsandstudents.com. This project, Plant STEM for K-12 Education, will incorporate STEM (science, technology, engineering, and mathematics) into activities that encourage children at eight public schools to learn more about plants’ roles in ecosystems, their uses for medicine, materials and fuels. The activities also will help students gain basic literacy on the promises and potential perils of cloning and genetic modification. The team will plant native gardens at six schools in Princeton and Trenton, New Jersey, with species that will be researched and described by students, connected via Bluetooth beacons, and integrated into a customized mobile app that will allow community members to learn more about each plant. Next they will establish three outdoor carnivorous plant habitats and three mobile carnivorous plant nurseries that will allow children in eight schools to discover ways that research into these species has informed discoveries in neuroscience, liquid-repellent surface materials, and medical adhesives. When winter comes and outdoor plants go dormant, students will investigate biodiversity in the world’s tropical regions, simulate how animal species depend on rainforest plants for survival, and make clones from common houseplants. In the spring, students at two area high schools will lead an investigation into genetic modification that will be shared with elementary and middle schools. In total, this project will reach 4,294 students in grades K-12, serve as a model to be implemented anywhere in the world, and will be available online for teachers and students to find lesson plans, instructional videos, blog posts, and real-world data aligned with Next Generation Science Standards (NGSS) and the 12 Principles of Plant Biology. Assessments will demonstrate what students have learned, and through ongoing (and sustainable) implementation, future scientists will understand the importance of plant biology in our modern world, advocate for plant research, build skills with new technologies, and facilitate communication between diverse groups of students. 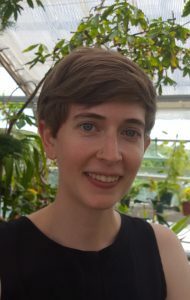 Under the guidance of Harvard University Professor Elena Kramer, first year graduate student Molly Edwards writes, produces, hosts, and releases monthly Science IRL episodes with the help of a creative team. Science IRL has already released a six-episode first season, and is currently in production of a second season at Harvard. During the BLOOME grant year, Science IRL will create 10 new episodes that feature guest plant scientists at Harvard and other leading plant biology institutions across the country. The episodes will correspond to ASPB’s 12 Principles of Plant Biology, and are written with a high school audience in mind but are available to all on YouTube. The episodes will be disseminated to New England high school classrooms with the help of Harvard’s Life Sciences Outreach (LSO) Program; on the website of the Amgen Biotech Experience, a curriculum that is implemented by over 70,000 students nationally and internationally; and by leveraging the considerable PR power of Harvard and the other institutions the team visits. Evaluation of the above learning objectives will consist of a pre/post observational study in New England high school classrooms and will be implemented with the assistance of LSO and Harvard’s Derek Bok Center for Teaching and Learning. With the production equipment purchased and the collaborator network built with ASPB funding, Science IRL will be able to continue its mission long after the grant year is over. Anyone can check out the existing Science IRL videos already produced and posted on the YouTube channel. The team will be releasing a few more episodes this summer and then the BLOOME episodes begin in September. In addition to posting updates on Plantae, IRL shares announcements and behind the scenes photos on their Facebook page. Anyone seriously interested in pursuing a BLOOME grant next year may interact with these and other BLOOME PIs in this private Plantae group.